song n. 1. a piece of music with words, composed for the voice. 2. the tuneful call or sound made by certain birds or insects. 3. the act or process of singing: they raised their voices in song. 4. for a song. at a bargain price. 5. make a song and dance.Brit. informal. to make an unnecessary fuss. 1. In a double bed, sing as many songs as we can remember. 2. Write the song title and name of the recording artist/s on the duvet cover. 3. No two consecutive songs should be by the same artist. 4. For a song to count, it must be at least one verse and one chorus long. 5. 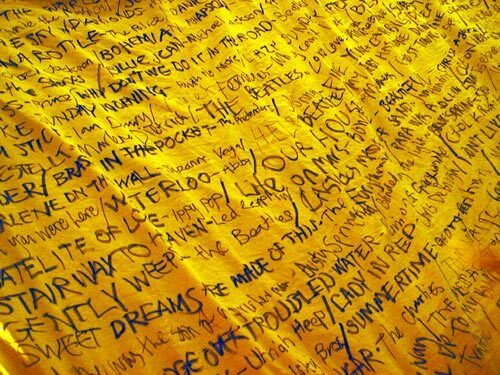 The action is over when one side of the duvet cover is full of song titles. 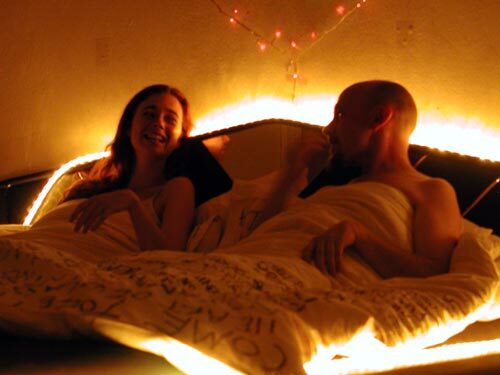 In the intimate world of our bed we spend our night discussing only the music that we can dredge from our memories. We create a comfortable atmosphere: the room strewn with pillows and easy chairs, lit only by the fairy lights above us and around the bed. It is an opportunity to hear long-forgotten lyrics or piece together the name of an obscure band. The spectators can come and go as they please, joining in with the songs or suggesting missing words if they feel the urge. After five to six hours we will be left with a bed full of songs written in black ink across the white duvet. As non-professional singers we bring our own untrained voices to this marathon task, playing out an intimate, domestic moment that a couple might share. Our sincere desire is to get through as much of the song as we can hear in our own heads and for our rendition to be as accurate to the original as our voices and memories allow. This is a pursuit shared with the spectators, their own memories tested with ours as we delve into that personal wealth of song material we all have. I was struck first, even after only a few songs, by the sheer ability of the performers to remember song lyrics at all. Looking back at a photograph of the duvet, I am surprised that the first song was the Beatles’ “Come Together.” At the time, I don’t remember feeling as though the choice was metaphorical or pre-meditated, although in retrospect the song seems especially apt for what Bed Full of Songs was able to do with its audience: to create a gentle, uncoerced sense of community. 12 October 2007 Gallery Leeds Met. University, part of the Light Night celebrations.